Creating the ultimate online shopping experience requires every retailer to implement the latest trends in eCommerce technologies in a logical way. We decided to highlight some of these in one piece so you can explore how these trends and technologies can enhance the online shopping experiences of your eCommerce store. As B2C and B2B eCommerce sectors accelerate in growth, CEO’s and Senior eCommerce retail management teams are constantly faced with reviewing their customer journey’s to analyse if they are aligned with company sales targets. Whether looking at your retail operations or eCommerce marketing strategy one element will be common and top of the list: ‘the customer experience’. Operating in both online and offline retail has never been more complex. With changes in consumer buying behaviour, the availability of new purchasing technologies and the need for more data collection (consumer and marketplace), the online purchase journey has become more convoluted. Creating the ultimate online shopping experience requires every retailer to implement the latest eCommerce technologies in the most simplistic way. We decided it would be a good idea to highlight some of these in one piece so you can explore how these technologies and trends can enhance the online shopping experiences for your customers. We broke them down into the following 6 areas. It’s nothing new to ‘brick and mortar’ retailers that atmospherics and other retail marketing tactics be implemented at every possible touch point within the in-store experience. However, the challenge has always and will continue to be replicating that intuitive in-store experience online. Known as “Omni Channel” retailing this strategy is not to be mistaken with ‘multi-channel’ where a retailer has both a physical store and eCommerce platform that operate separately. Omni channel retailing is dedicated to providing a seamless shopping experience for the customer no matter whether they buy online or in-store. The main advantage in adapting this type of strategy is that it won’t silo either of your selling platforms (Physical Store or eCommerce site). It’s architecture allows for both systems to work together and provide real-time data (for example eCommerce stock merged with Physical store and in-store POS system). Omni-channel retailing is made up of individual touch points along the customer journey (mainly with the use of digital technologies) that seamlessly connect allowing customers to pick up where they left off on one channel or device and continue on another. Applying the Omni-channel process to your existing retail business model. You might be half way there already! If you’ve looked at the Omni-channel elements above then maybe you can identify which process/es you are already engaged with. There are some other data points to consider that can be used to measure the success in the application of the Omni-Channel experience to your own business. Whatever the event or objective: posting on social media, setting up a digital ad or launching an email marketing campaign there will be one common priority. SPEAK TO YOUR CUSTOMERS AS INDIVIDUALS! It’s simple, no one wants to receive a message that’s not relevant to them. So personalisation is key to getting the most out of your eCommerce marketing strategies. We have all seen the personalisation on emails sent to us – that’s just a given at this stage! But what will ‘entice the click through’? Well normally if you can associate the title of the email as something of relevance to you it would generate an interest to find our more….. Most of these personalised experiences wouldn’t be possible without data. Normally used for information retrieval and decision making, data has an increasing importance in wowing your customers with personalised experiences along the customer journey touchpoints. The trick in using data to make the customer experience more immersive starts with AI – powered search. The goal of this is to increase dramatically the conversion time of the website visitor in deploying technologies that rapidly allow them to find the product they are looking for. The main element to drive this from a front-end perspective is the Site Search on your eCommerce site. These are some requirements and criteria to consider when developing your Site Search Engine. We have listed the Top 5 eCommerce Site Search Technologies for you to explore! When we talk about personalised web experiences there is no more an effective way to integrate them than allowing your customers control the product page of your eCommerce site. By allowing product customisation you also allow for individualisation and personalisation. Product configurators provide this experience, they are a tool that allows the core product being offered to be altered and customised (within range) to the users taste. This advanced AI Technology works with complex sets of rules and configurations (on the back-end) but delivers the user (on the front-end) with a seamless personalised real-time shopping experience. This technology was deployed rapidly by the automotive industry, as top car manufacturers saw the competitive advantage in integrating a product configurator tool for their customers online purchase journey. Porsche were the first to develop a product configurator tool in the industry back in 2015 for their range of sports cars. They ‘drove’ (excuse the pun!) the online customer experience and their sales by delivering this technology on multiple platforms opening up 40% more traffic on mobile devices alone! Take a look at the demo video below which was their first product configurator tool that they launched back in 2015. Although there have been many advances in this type of technology since, it does provide some great insight into it’s functionality, platform capabilities and personalised user experience. If we look at virtual assistants first and how they can personalise the shopping experience with your eCommerce store. There are a variety of activities that a virtual assistant can engage with from back-end operational duties like; product page updates – descriptions, imagery and product listings to front-end customer facing responsibilities like processing orders, returns, live chat, direct phone call and email enquiries. Having someone ‘Human’ to talk with can reassure your online customers that you genuinely treat customer care with the utmost importance in your eCommerce operation. Also having fully trained courteous staff available to handle queries with efficiency provides another opportunity to enforce that reassurance. There are obvious operational advantages in using virtual assistants; they are cheaper to employ than a full-time employee, they boost productivity as they are highly skilled at what they do, they also can conduct more intense marketing activities like social media interaction. Hitting the ‘Buy’ button on an eCommerce site can be a hesitant choice for some and that’s understandable especially when wondering…..
To quench this anxiety consumers need proof of intent to purchase – they need to be convinced they have researched the product and are satisfied with feedback from others. Some eCommerce operators will use social proofing to project scarcity or urgency, driving the need for a purchase. Order Now! to get next day delivery!! Book Now! to avail of today’s special offer – booked 20 times today already!! Order Soon! Before Sale Ends!- Limited Time Offer!! | Only 5 Left in Stock!! Other eCommerce stores leverage social proofing in a different type of way, building more trust and brand advocacy. Social Proof – leveraging the use of social media to validate your products success, it’s a perfect time to have a virtual assistant to help with your social media platforms and social listening for reviews and comments. 60% of consumers will expect some reply to a review they leave within 24hrs!! Influencer endorsement – for certain industry sectors like fashion and cosmetics brands rely heavily on influencer endorsements, normally celebrities who create that WoW! factor about products or services they review. Leveraging these reviews across your social media will win attention from a loyal brand driven audience. If you operate a physical store as well as an eCommerce one try to develop in-store relations, boost testing display areas to allow your customers to become fully immersed with your brand. Some of the larger eCommerce retailers have seen this as a vital new part of their brand selling technique and gone in reverse to open physical stores. Apple would be a good example in the technology sector as their stores allow the customer to get the real brand experience by being able to touch and use their product range. Some other eCommerce operators like Amazon and Google have now embarked on developing low-overhead Pop-up store outlets, some small but rich with an in-store experience. Visitors can interact with their product range and also have an attentive customer service team on hand to help engagement and drive sales. 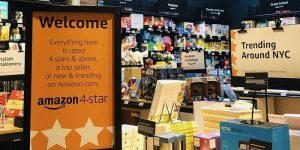 In the case of Amazon they only stock products that are rated 4 Stars or above on their eCommerce store and products with high performing or ‘trending’ sales volumes from areas around store locations. It’s an interesting way of leveraging their eCommerce geographical buyer behaviour data and applying it to their physical store layout! One other element you might want to consider is digital kiosks, they’re a great way of finding out more about your customers shopping behaviour. 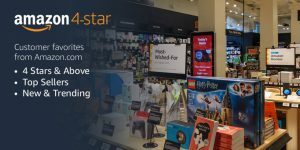 In-store kiosks will provide useful information on what customers look for on your eCommerce site and also provide an interactive experience with product reviews. Digital kiosks can also drive in-store sales by providing the opportunity for upselling products on a click and collect service from returning footfall. Finally and not by any means least important, is the review of your digital strategy touchpoints. As mentioned earlier touchpoints like social media, website traffic behaviour, shopping cart abandonment and sales product volume are all indicators on how your ecommerce brand is performing. There are others which need to be consistently analysed as well for shifts or indications of change whether it be positive or negative. If you are looking for more insight and expert advice on how to leverage these touch-points in order to maximise your customers shopping experience, please get in touch with izest Marketing Group. It’s no doubt that retailers have challenging times ahead in transferring a rich in-store experience to their online stores whilst protecting their bottom line. Customers expectations of the purchase journey have increased so immensely that it has caused a constant shift in buyer behaviour. Whilst the integration of new technologies to enhance the user experience has become the main focus for eCommerce providers, just so, as important is the human element to establish and develop trust. Combined they are sure to provide the ultimate online shopping experience.